Donald Francis Tovey (1875- 1940), Reid Professor and Dean of the Faculty of Music at Edinburgh University from 1914 until his death, was my paternal grandmother's first cousin. Although Tovey is best known for his Essays in Musical Analysis he was a noted concert pianist and also composed symphonic as well as chamber music. Among his work is an opera called The Bride of Dionysus to a libretto by Robert Calverley Trevelyan. The opera was produced by the Edinburgh Opera Company in 1929 and again in 1932 and conducted by the composer himself. Having read a biography of Tovey in 1990 (by Mary Grierson, published in 1952 by OUP) my curiosity about the opera got the better of me and after some detective work I traced the vocal score and the full orchestral score (all 750 pages of it!) to the Reid Music Library at Edinburgh University. The full score has never been published and the opera has never been performed again since 1932. In 1936 Fritz Busch wrote from Glyndebourne asking for a pianoforte score of The Bride with which he was already familiar. Tovey had hopes that his opera would be performed at Glyndebourne and to this end he wrote in the same year a letter to John Christie, the founder of Glyndebourne, who was a personal friend. It was decided, however, that the opera was too large for the stage requirements and too long. Three years later in 1939, after some reconstruction of the stage at Glyndebourne the matter was considered again, and it was decided that the opera should be given in 1940. But with the coming of the Second World War and Tovey's death in 1940 the project was laid to one side, never to be revived. As I began to play laboriously through the piano/vocal score, the piano part was written for a concert pianist which Tovey was, I couldn't help wondering why this beautiful music had been allowed to disappear without trace, gathering dust on the shelves of a library. I visited the Reid Music Library in Edinburgh to see what material, apart from the printed piano/vocal score exited. The full handwritten orchestral score existed as well as the hand-copied parts. But in the biography Tovey had complained that so much of the orchestral rehearsals had been taken up by correcting all the mistakes in the parts. I looked through the parts and found this to be true. So I decided the first thing to do was to transcribe everything onto the computer using a MIDI keyboard and notation program. Little did I know when I started transcribing the material that it would take me ten years to complete it. I still had a full-time job and growing family. The advantage of transcribing the opera onto the computer using the Coda Finale notation program is that one is able to listen and playback the material to check for mistakes. I was to discover later that many mistakes remained even after this process. The other advantage is that the computer does all the work extracting the parts from the full score. Although there is plenty of work left fixing the layout as well as planning suitable page turns and other necessary copyist jobs. So now I had a full score and a complete set of parts all neatly printed out and a pretty good idea what the opera sounded like. What next? I realised very early on that the chances of getting a performance of an opera which was nearly four hours long by a virtually unknown composer were nil. I began compiling a concert performance of approximately an hour in length, reasoning that this would stand a much better chance. This work was put back on the shelf while I went through the same process with Tovey's Symphony which had never been published either. Martin Anderson and Toccata Classics came to the rescue and in 2005 the Symphony was recorded in Malmö, Sweden with the Malmö Opera Orchestra conducted by George Vass (a complete description of this recording from the producer's point of view can be found on the MusicWeb - also recording review). It began to dawn on me that there was now a real possibility of recording my concert version of Tovey's opera. I began discussing this with George Vass (I could not imagine anybody else conducting it!) and we began going through the whole opera to decide what could be used and remain true to the plot. The reader may be wondering why I didn't contemplate recording the whole opera. I do not have the financial resources to record all of it and thought that the recording we were planning was better than nothing at all. I am prepared to be criticised for this and offer no apology. If anyone else wishes to record (or perform) the whole opera I am only too glad and have a full orchestral score and a complete set of parts which they are welcome to use. 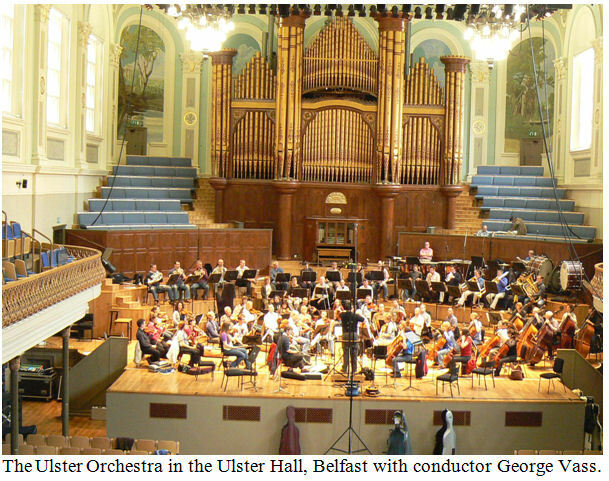 We decided to return to Belfast and the Ulster Orchestra who had done such a magnificent job on the cello concerto recording. So they were contacted and recording dates were planned for the end of May 2009. The next problem was finding the soloists. I had heard the soprano Sally Silver, originally from South Africa, sing several years previously and decided she was the voice of Ariadne, the daughter of King Minos. Sally was approached and agreed to sing the role. George had worked previously with the mezzo-soprano Yvonne Fontane who has received international acclaim for her interpretation of Carmen and is artistic director of amongst others the Lakeland Opera. Yvonne would sing the role of Phaedra the younger sister of Ariadne. Robert Johnston, the tenor and Michael Bundy, the baritone who are both members of the BBC singers have worked with George on many occasions and have a great deal of operatic experience. Robert would sing the role of Theseus and Michael would sing the roles of both King Minos and Dionysus. The chorus is an integral part of the opera so the next problem was finding a suitable choir. We contemplated bringing a choir with us but decided that this was financially impossible. I had heard both positive and negative reports of the Belfast Philharmonic Choir. But their choir-master Christopher Bell is well known for achieving great results. Michael Ponder was asked back as recording producer. John Benson unfortunately had a prior engagement but we decided to use the BBC's facilities together with senior sound engineer Davy Neill assisted by Alex Forsyth. Our chief engineer would be Anthony Philpot. Tony Philpot had a long career as a senior sound supervisor at BBC TV but has been a freelance engineer for several years. He is a church organist and has been for over thirty years. Tony and I were at school together and although we have kept in touch over the years have only recently been working together. So now the team was complete. The soloists, George, a rehearsal pianist and I had a run-through of the opera at a rehearsal room in London two months prior to the recording. I then flew to Belfast to complete negotiations with David Byers the chief executive officer of the Ulster Orchestra and meet Davy Neill to discuss the technical requirements. Davy was happy to have Tony Philpot at the controls and knew him by reputation. I went along to the second rehearsal of the choir and realised that although they had a long way to go they were very keen to be a part of the recording and that they were in the very capable hands of Christopher Bell. A project of this magnitude has basically three phases. Pre-production, production and post-production. The logistics involved require a great deal of planning and the more thorough one is in planning the less likelihood of problems arising and costing both time and money. But problems are unavoidable! We would require six three-hour sessions at least to record all we needed and because the choir had day jobs they would only be available at the weekend. So we started on Thursday 28th May 2009. The morning was taken up by the engineers rigging a large quantity of microphones. The orchestral staff were putting out all the chairs and music stands and Paul Mckinley the orchestral librarian was busy putting all the orchestral parts in the right place. The Ulster Hall had recently been renovated and the paint was hardly dry. 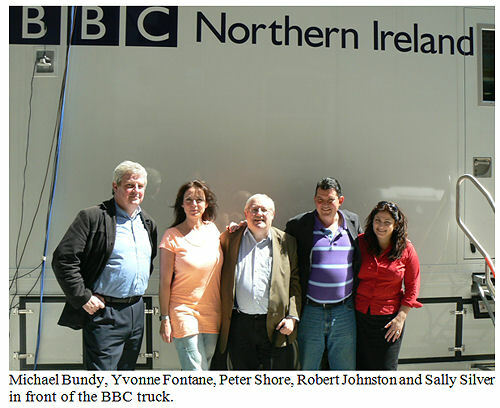 When recording the Cello Concerto we had used the BBC control room in the Ulster Hall but the new control room would not be ready for the opera and so we had to use the BBC's sound truck which was parked in the road outside the hall. An optical fibre cable with all the microphones signals trailed through the hall and through a window to the truck outside. The technical team managed to squeeze into the truck with Tony at the controls of the mixing desk, Davy monitoring everything and keeping a record of all the takes, Michael producing and Alex making sure all the computer systems were functioning correctly and that the material was being properly stored on hard disks. I had decided that each microphone should be recorded on a separate track ie multitracked. The BBC engineers are very used to producing a stereo 2-track signal for live broadcasting but multitracking everything gave us the option of adjusting levels on each channel during the mixing and editing process giving us the best possible final result. 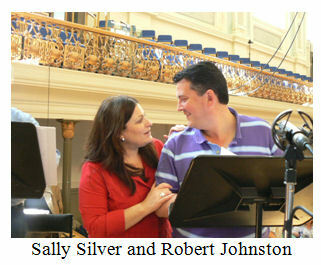 We started recording on the Thursday afternoon with Robert and Sally's arias and their duet. Tony quickly got a good stereo balance which was recorded on two tracks of the multitrack and would provide a good reference as we recorded the rest of the opera. We reckoned on recording between 15 and 20 minutes worth of material at each session and by the end of the session we had recorded all the material planned. The Friday morning session was purely orchestral and opened with the Prelude of the opera. I had already heard this when I recorded Tovey's Symphony in Malmö in a broadcast studio which only just accommodated the Malmö Opera Orchestra. What a difference hearing it again in the wonderful open acoustic of the Ulster Hall! David Adams the orchestral leader played the solo violin part at the end of the Prelude so beautifully and with such feeling. Then came the orchestral opening to Act 2 which is full of pomp and circumstance which melts away to piano in the strings as the curtain rises to reveal the Labyrinth bathed in moonlight where dark deeds are about to take place. Robert and Yvonne added their parts to the next orchestral interlude which is the death of the Minotaur. This is pure film music and we hear Theseus running through the Labyrinth and meeting up with the Minotaur, half bull, half man. They start fighting and the Minotaur is fatally wounded and falls down the stairs. Distant trumpets are heard warning Theseus of the approaching Cretan guards and he makes his escape through the Labyrinth to meet up with the Athenian captives who have also escaped and are waiting for him by the shore. ”Hail friends, slain is the Minotaur!” Theseus cries out and they make their escape by boat from Crete. The afternoon session was devoted to Phaedra's aria, the longest and most difficult one in the opera. The role of Phaedra was written for a contralto but I thought a mezzo-soprano would give a much better result and Yvonne Fontane proved me right. The escapees have arrived on the island of Naxos including Ariadne, Phaedra and Theseus. Theseus is still in love with Ariadne and Act 3 opens with Phaedra standing by a small fire using her witchcraft to bewitch Theseus and entice him away from Ariadne. The aria is very chromatic with many key changes and whole scales and borders in places on the atonal with sweeping harp glissandi to illustrate the flickering flames of the fire. Phaedra reaches the climax of her aria with the words ”He is mine!” and Yvonne thundered out her top A. I was sitting on the stage opposite her and that moment the hairs on the back of my neck stood up and I felt a tingling all down my spine. That's what music can do for you! Saturday morning and the whole ensemble was gathered to record Act 1, Scene 1 of the opera. The four soloists at the front and the 100 strong choir who were seated behind the orchestra in the galleries on either side of the organ. The morning session went well and we completed the choral sections in Act 2 before breaking for lunch. George and I had been to the last rehearsal of the choir on the Wednesday evening and knew that we had nothing to worry about. They had been well rehearsed by Christopher Bell and were so enthusiastic about doing the sessions at the weekend with the orchestra. I reminded them that we were recording an opera and not an oratorio and I expected plenty of expression from them. I was not disappointed! After lunch we said goodbye to Robert and Yvonne who had completed their parts and I was sorry to see them go as they had given me such wonderful performances. In the afternoon we moved onto Act 3 Scene 9. Michael Bundy now changed roles and instead of the irascible King Minos he took on the mantle of the serene god Dionysus. Tovey states in the score that Dionysus is the majestic God shown on a Greek Vase, not the Bacchus of Titan. The session went well and we took a break just before the Piu Largamente which leads into the Finale. After the break disaster struck! I explained at the beginning of this article about the process of transcribing the handwritten score onto the computer and extracting the parts. However hard one tries and however many pairs of eyes scrutinize every page and every part mistakes get through. Horn parts are different for historical reasons. Before the invention of the valve in the early years of the nineteenth century brass players, with the exception of the trombone could only play notes of the harmonic series. When the rest of the orchestra changed key the horn player had to add an additional length of tubing called a crook and play a different harmonic series to match. There was no key signature in the horn parts only an indication to change to another crook. When valves were introduced the horn parts retained the tradition of having no key signature but as the player had more access to more notes accidentals (sharps and flats) were added in front of the notes that required them. In extracting the horn parts of the Finale from the score the computer had left out the accidentals and in the rush to get the parts ready I did not notice they were missing. As we began recording the Finale a lot of very wrong notes started come out of the horn section. Everything ground to a halt and the leader of the horn section stood up angrily complaining about the unprofessional behaviour of the copyist. I replied that I took full responsibility for the mistakes as I had done the copying and was prepared to 'face the music'. The session came to an abrupt halt and everybody packed up and went home. I left the hall deeply depressed and went into the sound truck to apologise to everybody there and was on the point of calling the whole thing off when my friend Tony Philpot took me on one side and told me not to worry that everything would be sorted out and we would pick up where we had left off the following morning. George had immediately gone to talk to the horn section to perform a public relations job on my behalf. I returned to the hall and went up to David Adams the leader to apologise to him. David told me to bring the horn parts and the handwritten score and that we would sit down there and then and correct the parts together. This is not the job of the orchestra leader, but David is such a nice person and dedicated musician and, as this was to be his last recording session with the Ulster Orchestra before he took up his post as leader of the Welsh National Opera Orchestra, he wanted it to be a success. So we sat on the stage for next two hours and wrote in all the missing accidentals. I then went back to the hotel which fortunately was just across the road from the Ulster Hall and spent the rest of the evening checking the horn parts for the whole of the Finale. The morning session on the Sunday was to be our last as the hall was booked for another event in the afternoon starting at 4 pm and the engineers and orchestral staff needed the time to dismantle everything. I approached the horn section with some trepidation but after checking the parts they said they were happy to get on with the recording. I went down to the front of the stage and sat down behind the soloist, George raised his baton and we were off. Michael Bundy now in the guise of Dionysus sang ”O thou pure soul, thou chosen shrine of justice and love”, with his magnificently rich baritone voice echoing round the hall. The choir came in with their big final chorus ”blessed art thou o bride divine”. This was their big moment and they did not waste it and sang with such gusto. Tovey shows his mastery of counterpoint by bringing in many of the themes and motives which have been heard previously in the opera passing them back and forth between orchestra and chorus with a fugue thrown in for good measure. The orchestra builds up to a powerful fortissimo tutti backed up by everything in the percussion department and as the choir intone their final notes they are joined by Ariadne's voice ringing out above them. She continues her final aria with a rich orchestral accompaniment climbing first to a top B flat, then a top A and finally a perfect top C which resounds round the hall and is answered by a top C from the trumpet. She ends her aria with the words ”with the fullness of thy godhead made whole” and the orchestra builds up to a final fortissimo tutti dying away as the solo violin plays the same solo from the Prelude and the opera finishes on a D major chord in same key as it started. My dream had come true! Words failed me and I was completely overcome. Of course there was still the editing and post-production work to be done but we were extremely lucky that Michael Dutton of Dutton Vocalion and his A & R consultant Lewis Foreman had agreed to release the opera on the Dutton Epoch label which specialises in British classical music. Its out and now available in the shops and on the Internet. I am so grateful to all those who made my dream come true and I am well aware that without the help of so many talented and enthusiastic people none of this would ever have been possible. I can see Tovey sitting on his little white cloud with a big smile across his face. To him music was his life, his all and his compositions mattered to him.